Candlestick charts were developed in Japan in the 17th century by the rice merchant/trader Munehisa Homma. Candlestick charts have gained popularity among traders over the past years and is now probably the number one choice when it comes to charting. The method was brought to the West by Steve Nison who has written several books on candlestick charts. I highly recommend reading his books, Japanese Charts….. Personally, I only use candlestick charts since those charts capture the psychology of the market very well. Every day (or other trading interval) produces a candle with an open, close, high and low mark. The area between the open and close is called the real body, while the other price levels traded outside these levels are called shadows, with the low and high being the ends of the shadow. A positive day (hollow) will have a white (or other color depending on personal preference, many use green or blue) candle. A negative (filled) day will be filled. Many traders use black candles (red is also a good color to consider) for negative days. The image of a candle will directly give the feeling of what psychology currently prevails in the market in a very efficient way. A long body shows that action during the time interval has been big and dynamic, while a small body indicates price action has been rather boring. Clean bodies are candles where the price action has been mostly one way. The stock has typically opened at one price and developed in one direction only. These days are powerful as they indicate bulls or bears are in charge. The term in Japanese is Marubozo, which means shaved head in English. Candles with long shadows and small bodies indicate that the price tried to move up/down but reversed to close at similar levels to where the day opened. One can view that the price came back, indicating some sort of indecisiveness and could be a possible reversal signal of the prevailing trend to change soon. A similar candle to the above is the spinning top, often a strong warning signal of a possible reversal of the prevailing trend. All individual candles need confirmation, so a spinning top itself is not sufficient to call it a certain reversal. The doji is the candle where the price opens and closes at the same level. The shadow can be large or small. This candle indicates nobody is in control and is reflecting the indecisive psychology among traders. A doji after a strong trend many times indicates the bulls/bears during the trend are showing signs of getting a bit tired as they can’t push the price further into the same direction. Individual day candles need to be put in a context with other days in order to get a formation that is more reliable. There are various relationships/combinations in candlestick charting where two or more candles make up a psychological pattern explaining what is happening in the market. The star position happens when a strong trend suddenly gets interrupted by a not so convincing candle. It is often an early indication something might be happening to the trend. Another reversal pattern (still needs confirmation) is the well-known harami (pregnant woman in English) formation. Note how the smaller candle, day 2, is within the body of the first day candle. The hammer is potentially a very strong reversal candle. Price action is represented by a large intraday move, but where the price comes back and closes relatively near the open price. The hammer creates a candle with a long shadow on one side of a small body. If the prevailing trend has been down, the hammer candle develops close to lows. 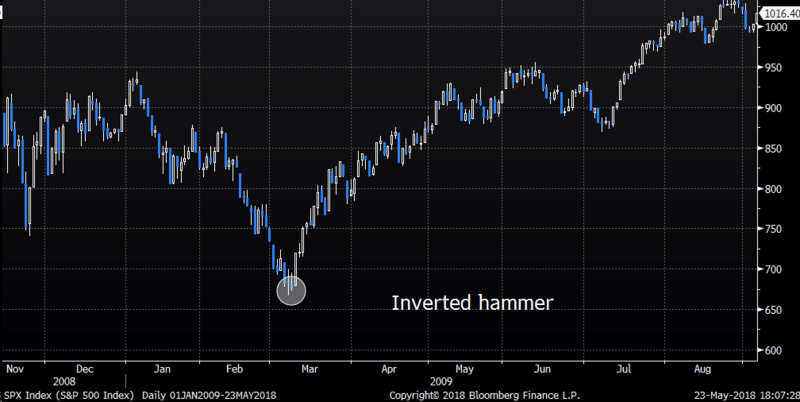 The psychology behind the hammer formation is that investors start pushing the asset lower, but a reversal happens during the day, leaving the price for the day often practically unchanged. The candle needs a confirmation but definitely marks a big warning sign to traders that think the trend will continue as it has until now. 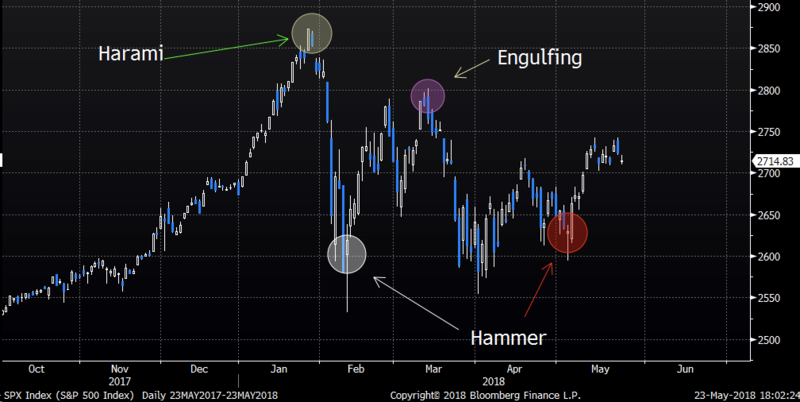 The hammer formation signals a possible strong shift of the psychology. The hammer is called a hanging man candle when encountered in up trends. The same market psychology is found in the inverted hammer formation. Traders try pushing the asset pre-maturely higher, but it doesn’t have the momentum to close strong. Despite a relatively weak close the intraday action is characterized by the big shadow and is an indication to shorts (in a down trend) to consider closing shorts as there is a possible trend reversal happening. The inverted hammer that occurs in an uptrend is called a shooting star. S&P 500 chart with some powerful candlestick reversal signals that were all followed by big moves. The entire market turned at the magical 666 level on the S&P 500 index back in March 2009. Note that the low close of the entire financial crisis was marked by an inverted hammer followed by a huge confirmation candle the day after. The S&P 500 is up approximately 300% since that inverted hammer. 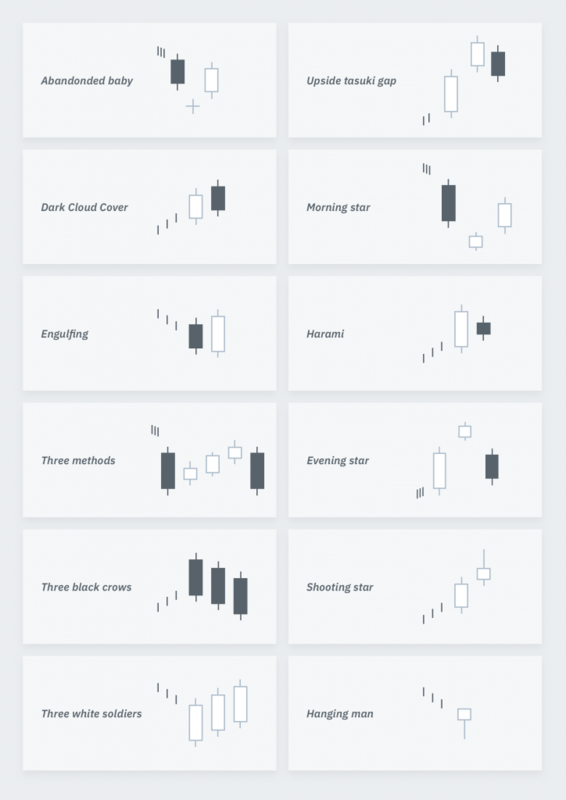 Brief summary of some of the most popular candlestick patterns.